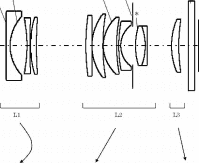 Our friends in Japan, Egami, the photography blog has discovered two new patents filed by Canon Japan for two lenses with the 4:3 ratio. The Blog is written entirely in Japanese and the Google translation is not very good but this may suggest Canon is working on another sensor format. This is nothing unusual. Canon is a big company and spends a lot in R&D. However, they are 'slow' in their product introduction. Case in point is their EOS-M camera, which came out after almost every camera manufacturer has introduced their models.